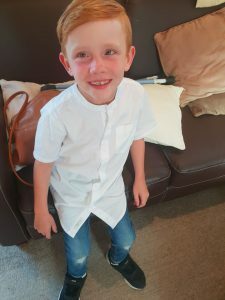 Hi, we have been holding a range of events since 2013 to raise money for our 8yr old son Oakley. The fundraising target is £80,000 and we would like to thank everybody for their support and fundraising efforts so far, which has enabled Oakley to go to America for an SDR operation, successfully performed By DR T.S PARK in 2013 and four years of physiotherapy and strength conditioning training, getting him up on his feet and taking independent steps and walking short distances. However, we still have a way to go to reach our target. Most recently on the 15th of August 2017 Oakley had a follow up operation called “Hamstring lengthening” which was performed at Southampton general hospital by Dr Caroline Edwards. This operation released/lengthened his ham-strings enabling Oakley to straighten his legs better. After a lot of strength and conditioning training Oakley will be able to walk better and without a painful crouch. We have put this operation off for four years now, concentrating on Oakleys strength. Oakley will be forever having intensive, painful stretching programs for years to come. The Hamstring lengthening operation can only be done a couple of times as the surgical procedure becomes more and more difficult. The strength/conditioning training and physiotherapy is very expensive which is why he constantly needs funds coming in. Eventually, after a great deal of hard work and therapy we will all see Oakley’s life change as he will be walking almost as normal as you or I, having a much better lease of life, being able to run an play with this brother Mykey. Oakley was born nine weeks early alongside his twin, Mykey. The birth was very eventful as we had to get through a snow blizzard which took two hours to do four miles to get to the hospital in time! Oakley was born half an hour after his twin Mykey and it was during that time that we believe Oakley incurred some brain damage. Oakley was 18 months old when he was diagnosed as having Spastic Diplegia Cerebral Palsy. A couple of the symptoms are a painful tightness in his legs, and next to no strength in his core, so he was unable to walk or sit independently. We are now fundraising with the Bradley Lowery Foundation.